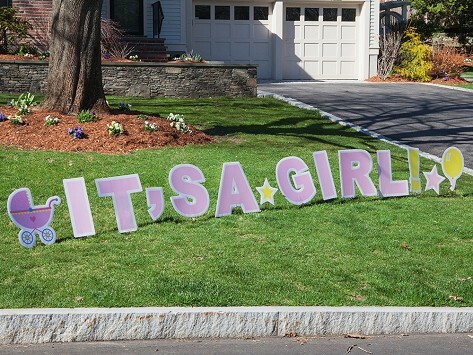 Tell the whole neighborhood “It’s A Girl!” with one cheerful lawn sign. It acts like a jumbo greeting card opened up on your yard—complete with pink and yellow stars, balloons, and rattle shapes. Stake it into the ground, and just like that, you can share your big news in a big way. Dimensions: 15' x 0.25" x 18.25"
Go big when celebrating milestones or happy occasions—like, all-the-way-outside big. An enormous, joy-filled lawn sign from My Yard Card is like a jumbo greeting card opened up in front of your house. Share oversized birthday wishes, celebrate a new baby or birthday, greet guests, or show off your patriotism. The messages serve as a great backdrop for photos on special occasions, too. Marketer-turned-entrepreneur Yvonne Erwin created My Yard Card to bring a fun, unique twist to celebrations—and make people smile. Whatever statement you make with one of these oversized signs, your yard will definitely be the talk of the neighborhood.